Aminoactive Australia (the company behind Max's Supplements) was formed in Melbourne, in 1989 by Keith Ellis, a highly successful bodybuilder through the 1970's and 80's, and Paul Kirkham, a biochemist who specialises in sports nutrition. Aminoactive (Maxs) has grown to become one of Australia's leading bodybuilding and sports nutritional supplement companies. Max's Amino Active provides a diverse and popular product range, having served athletes and recreational trainers for decades. MAX'S provides a wide variety of muscle building and performance supporting supplements. MAX'S Supplements are all about providing a practical way of attaining protein and other important nutrients to support natural muscle mass and exercise recovery. 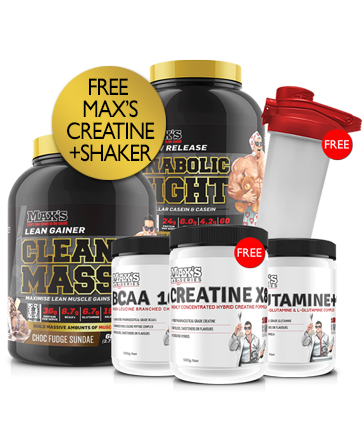 MAX'S has the hardest trainers nutritional needs covered with products such as MAX'S Absolute Mass, MAX'S Clean Mass, MAX'S 100% Pure Whey, MAX'S Whey Isolates WPI, MAX'S SuperShred, MAX'S Creatine X8, MAX'S Muscle Meal Cookies and MAXS Super Shred Protein Bars. All Max's supplements are formulated by their in-house team of food technologists and sports scientists. The products are also made in Australia using only the finest ingredients, while incorporating the latest technology and scientific research from around the world. Max's Supplements will never comprimise on quality allowing you to use their product with total confidence.